Top secret, viruses with RNA genomes! Today it is well known that viruses may contain DNA (poxvirus, mimivirus) or RNA (influenza virus, Zika virus), but for many years it was thought that genomes were only made of DNA. The surprise at finding only RNA in a virus is plainly evident in a 1953 letter from Harriett Ephrussi-Taylor to James D. Watson (pictured, Cold Spring Harbor Archives Repository*). While DNA was discovered in the late 1800s, its role as genetic material was not proven until the famous experiments of McLeod, Avery, and McCarty, published in 1944. They showed that DNA from a strain of Pnemococcus bacteria that formed smooth colonies, when added to a rough colony former, produced smooth colonies. By this time many viruses had been identified, and it was assumed that their genetic information was DNA. The ‘kitchen blender’ experiments of Hershey and Chase in 1952 proved that the genetic information of bacteriophage T2 is DNA. Watson and Crick proposed the double-helical structure of DNA in 1953, and a few years later published the Central Dogma, which suggested that information flowed in biological systems from DNA to RNA to protein. 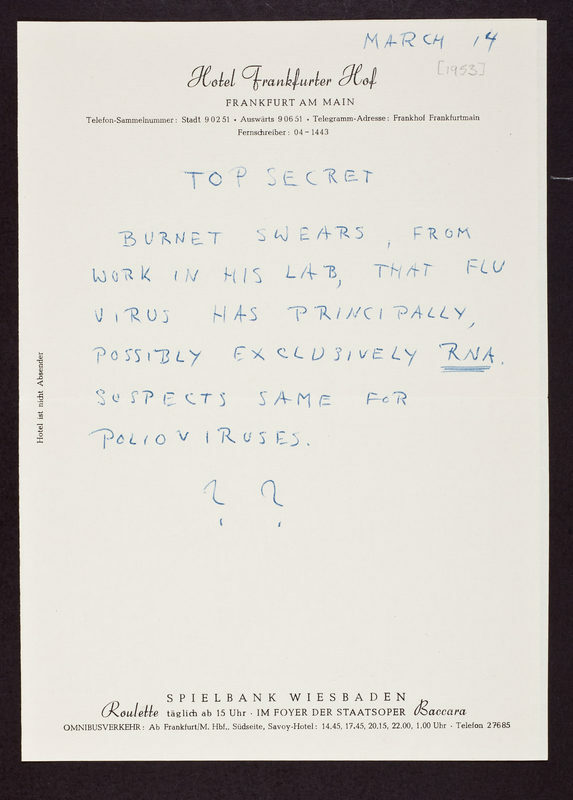 Burnet swears, from work in his lab, that flu virus has principally, if not exclusively RNA. Suspects the same for polioviruses. ?? During her career, Dr. Ephrussi-Taylor carried out work on bacterial transformation by DNA and was knowledgeable about its history as genetic material. Frank Macfarlane Burnet was an Australian immunologist who worked on influenza virus early in his career. By the 1950s many viruses had been isolated which we now know have genomes of DNA (bacteriophage, poxvirus) or RNA (yellow fever virus, poliovirus, influenza virus). But it was the first virus discovered – tobacco mosaic virus, in the 1890s – that lead the way to establishing RNA as genetic material. Wendell Stanley produced crystals of TMV in 1935 and found that they contained 5% RNA. But Stanley and others thought TMV was a protein, and that the RNA was either a contaminant, or played a structural role. A structural role for RNA was reinforced as late as 1955 when Heinz Fraenkel-Conrat separately purified TMV protein and RNA. When he mixed the two components together, they formed infectious, 300 nm rods. When the RNA was omitted, noninfectious aggregates formed. This finding reinforced the belief that RNA helped form virus particles. This view changed when Fraenke-Conrat gave his wife, Beatrice Singer, the task of purifying TMV RNA until it had lost all infectivity. To everyone’s surprise she found that TMV RNA itself was infectious, proving in 1957 that it was the viral genetic material. However, RNA also has a structural role in TMV virus particles, as it organizes the capsid protein (yellow in illustration at left) into regularly repeated subunits. Demonstration of infectivity of RNA from animal viruses soon followed, for mengovirus, a picornavirus, in 1957 and for poliovirus in 1958 (the latter done at my own institution, the College of Physicians and Surgeons of Columbia University!). By the early 1950s the idea that RNA could be viral genetic material was clearly in the minds of virologists, hence Ephrussi-Taylor’s amusing letter on influenza virus and poliovirus. *Thanks to @infectiousdose for finding this amazing letter.